Nokia go back to add one more series to the business public. This time, not only offer super-fast data roaming via HSDPA networks (10.2 Mbps), but also provides the ability to delay the uplink via HSUPA channel (2 Mbps). In addition to the solid network, the phone operating system also brings the most new. 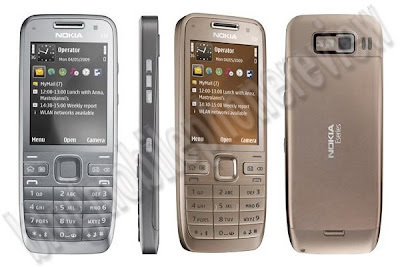 Namely, Symbian OS, S60 rel. 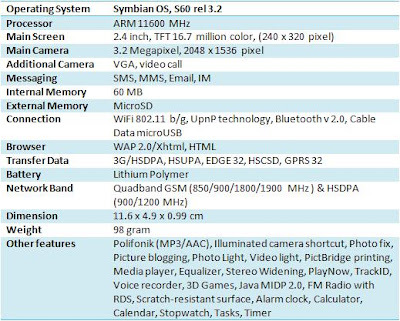 3.2 and 11 supported ARM processor with 600 MHz clock speed. Views physical Nokia E50/E51 similar, but slightly more slim with the metal. Reasonable, any thickness of less than 1 cm (0.99 mm). For easy access to business facilities such as email and calendar, the Nokia E52 using the OneTouch keys plus a comfortable keyboard, with predictive text recognition capabilities and motion sensors. This mobile phone is also equipped with GPS Assisted-GPS support. Meanwhile, using a digital map for Nokia Maps 3.0. Like most of the present mobile phone business, Nokia E52 also has a WiFi connection as the media. This facility can also be used for VoIP over WLAN.